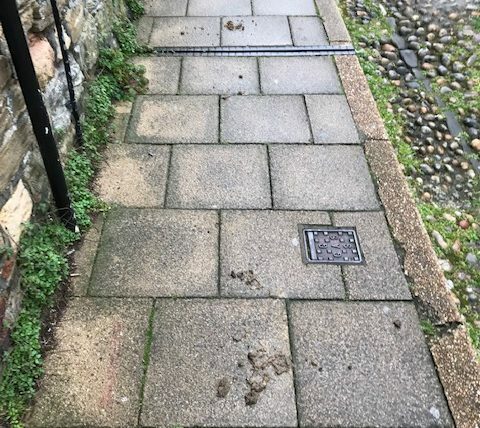 It is horrifying to notice the amount of dog mess that selfish and irresponsible dog owners leave on the pavements of Rye. As a dog owner myself I cannot believe that anyone is not aware when their dog is relieving itself. It is highly anti-social to not carry a poop scoop and disposable bag when walking a dog in a public space. Dog owners who fail to comply with the Rother District Council’s environmental protection order can be prosecuted or issued with a fixed penalty notice of £100. Dog waste can be disposed of in dog bins, street litter bins and at home in your black household waste bin. If you would like to make a dog fouling complaint please phone 01424 787000 or visit Rother Council’s How to Complain page to submit an Environmental Health complaint online. Let’s name and shame people who allow their pets to foul Rye. I have never heard anybody getting prosecuted for dog mess that’s the reason why the law doesn’t exist it’s the same as feeding seagulls has anybody been prosecuted I doubt it until people get there name and shamed it will continue all talk and nothing else as usual.